What happens every day at the most innovative university in the nation? This is your chance to experience Arizona State University on the Tempe campus! Visitors have the opportunity to participate in hundreds of interactive activities and talk to students, faculty and staff. Thrill seekers, lifelong learners, science gurus, art enthusiasts and adventure seekers can hear firsthand about rare poisonous insects, space exploration, volcanoes, drones and robots, medical breakthroughs, and Mayan discoveries. Interactive, hands-on activities include the art of street-style dance, language lessons, testing musical talents in the “Instrument Petting Zoo,” walking in the shoes of a medieval knight, and becoming a meteorologist by using technology to predict the weather. 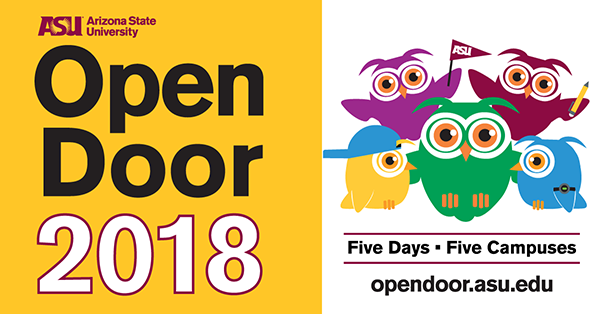 ASU Open Door @ Tempe is the day to come experience the creative energy that powers a world-class university!